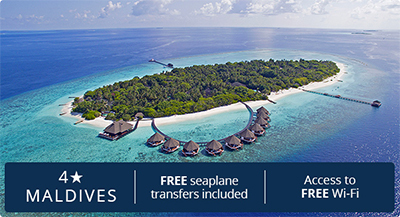 The Maldives is where colour comes to life – it's better than the pictures. Plunge into a warm lagoon and see if you can spot a manta ray or school of yellow butterflyfish swim past your snorkel mask; or sign up for a sandbank picnic on a deserted beach, where the water is fluorescent-blue and the sand is pure white. We can tell you all this because we've been travelling around these paradise islands for over 30 years. Stroll to a secluded sandbank with a picnic and a good book, or hire a free kayak and head out on the water. Weekly excursions at this 4* retreat include island hopping trips, submarine sightseeing and sunset cruises. Watch a classic film at the beach cinema, snorkel along the coral garden, or relax at the stunning overwater spa. At this stylish 5* retreat we've included a free upgrade to a split-level Deluxe Villa, just a few metres from the water. 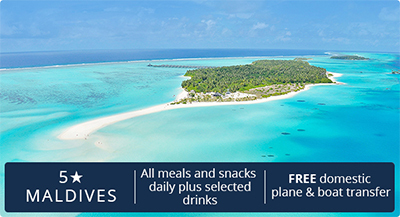 Exclusive to Kuoni guests in the UK, this 4* resort has a stunning sandbank and two oceanfront infinity pools. We've added free room and meal upgrades here, so you can enjoy superb dining and a bungalow right on the beach. Take a walk along the island's dramatic mile-long sandbank for striking sunset views over the lagoon.